Apple’s renaissance began with the iPod. This was not evident right away however. The product was unveiled on October 23, 2001 at a time when Apple’s share price had just fallen 70% from year-earlier levels. It was perhaps a good point from which one could expect a recovery to begin. It was not to be. One year after the iPod’s launch the stock price had fallen another 20%. Indeed during 2001 the company was in the throes of a “bear market” in its shares. 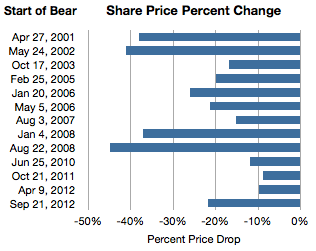 If we measure a time of persistent share price reduction as a bear market, then the one in 2001 was significant. For 154 days, between April 27 and September 28, 2001 the shares fell 38%. This represents the first bar in the following graph showing all the Apple bear markets since then. I also illustrated these bear markets in terms of their duration and the average %drop/day. From May 24th 2002 and September 27th, 2002 the stock fell 41%. 2003 was less harsh but on the second anniversary of the iPod, for two months between October 17th 2003 and December 19, 2003 the stock fell another 17%. By 2004 the iPod looked like a hit. The stock rose consistently during the year. Then, in early in 2005, from February 25th to May 13, the stock fell 20%. In early 2006, January 20th to March 10th, the stock dropped 26%. The iPod was reaching incredible levels of popularity and the Mac was looking to be returning to prominence with the switch to Intel. 2007 was the year the iPhone launched. Right after the launch for two weeks between August 3rd and August 17th, the stock fell 15%. That’s the equivalent of 1% per day for two weeks. As the iPhone was shown to be a hit (and before the credit crunch), for four weeks during January 2008 the stock fell 37%. Again, equivalent to 1% a day for 35 days. Then after the iPhone 3G was launched and growth reached triple digits, Apple’s shares fell for 50 days. From August 22 to October 10th they fell a total of 45%. Again, the equivalent rate was 1% every day for a month and a half. In 2009 the stock recovered steadily but in 2010, again around iPhone launch season the stock fell 12% over a two month period. Then in 2011 October, 9% was wiped out. Then for two weeks in April 2012 10% disappeared. Which brings us to September 21 to November 9th, 2012. This latest “bear market” has run up a loss of 21.7%, running for 49 days. Sounds dramatic. The even more dramatic twist is that in this same time frame the share price increased by 576 points or the equivalent of 6,294%. Nevertheless, there were 13 episodes when the shares dropped violently and sometimes persistently for long periods. It’s important to recall that at no point during Apple’s ascent was there “consensus” that Apple was being successful and certainly not sustainably so. Analysts gave it at best a growth prospect of 20%, and the risks were always obvious and prominent. The company was always on the edge and everybody from the layperson to the experts could see that everything was wrong with Apple. Apple went from being irrelevant to being too big without passing through being boring. So there is a simple explanation for occasional panic: Apple is not predictable. But it also seems too consistent. Is the pattern of share price collapse actually rooted in some fundamentals, transient or otherwise? There is a clear failure in understanding the long term but were these downdrafts justified as the market “foresaw” or “discounted” the near future? Were these more than just crises of confidence? Was there wisdom in the drops because they were followed by earnings drops or slowing growth? In other words, if there was smoke, was there fire? Was the market being efficient? The graph below shows the share price change in the more recent episodes above and the earnings growth during the current and following quarters. At least since the iPhone launched, every dramatic drop in share price was followed by a surge in earnings growth. One could even say the worse the bear, the better the growth. Sounds completely counter-intuitive, but there is some perverse logic in this as well. The market reflects crises (as well as over-abundance) of confidence. Unforeseen growth is what creates wealth and the crisis in confidence is a reflection of the improbability of continuing out-performance. When Apple’s performance is foreseeable the stock moves slowly upward. When its performance is unforeseeable the stock moves dramatically downward. Another set of similar observations were made by Eric Jackson in early October in Forbes.